When it comes to healthy eating and lifestyle, it’s the little things that can really add up to make a big difference. Think “diet” and you might assume it requires a radical revamp of your life or misery-inducing restrictions. Diets also have been shown to not work for long term success; most people gain the weight back over time that they worked so hard to lose. When it comes to lasting weight loss and permanent health transformation, research shows you’re better off making small, consistent changes rather than aiming for a major diet or lifestyle overhaul. The key is to create realistic, sustainable and enjoyable habits and incorporate them into your every day life. There are also other factors to your health than just what you eat. Your daily activity, exercise, stress management, sleep, mental & emotional health, relationships and supplementation are also major players in your health. This week, what aspect of your health would you like to improve? Refer back to your top 3 SMART goals. In what way(s) could you improve this area? One of your top goals was to have a consistent exercise program. Dr. Senz recommended that you exercise 5x a week, as this will help you manage your blood pressure, blood sugar and aid in weight loss. What do I need to start exercising? Maybe it means getting new workout shoes, some home equipment or a gym membership. What will I do for exercise? Cardio, strength training, a class? What do I enjoy? How long and where will this take place? Decide on some specific dates & times that work best in your schedule. Once you have decided how you will start, then write out WHEN you will get started on this specific habit. Remember to START SMALL. Although the long goal might be 5x a week of exercising, pick a reasonable goal based on your current lifestyle. It is better (and safer) to start with 2x a week rather than going all out every day. Need help with deciding on a healthy habit action plan? Don’t hesitate to reach out! Set a daily step goal using your phone or activity tracker. Work up to 10k steps a day! Stand versus sit at while working, phone calls etc. Do your rehab exercises as prescribed for your spinal health. Park in the farthest spot at every parking lot. Take 3 minute movement breaks throughout the day. Take a walk (start with just 10 minutes) before or after work. Take up your favorite recreational activity: swimming, tennis, hiking, biking, dancing etc. Improve your flexibility with stretching. Increase your water intake (rule of thumb is 1/2 of your body weight in ounces per day). Eat a new color in your meals. Try a new vegetable or fruit. Try a new recipe or meal idea. Throw away the white flour and sugars in your kitchen. Switch to almond or coconut milk instead of dairy milk. Eat (a protein rich) breakfast. Un-Plug for 15 minutes daily. Journal or connect with a friend or loved one. Create a peaceful night routine. Increase your sleep; the goal is 7-8 hours per night. 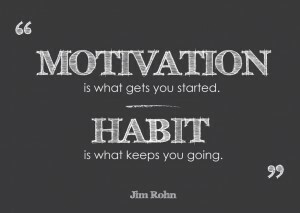 What new habit will you start this week?